Why do we feel terrible when we begin standing up for ourselves? People pleasers are so use to staying silent, accepting abusive and critical verbal abuse that speaking our mind feels unnatural and uncomfortable. Going along with the general consensus, and not making waves was our MO for so long we believed this to be normal. 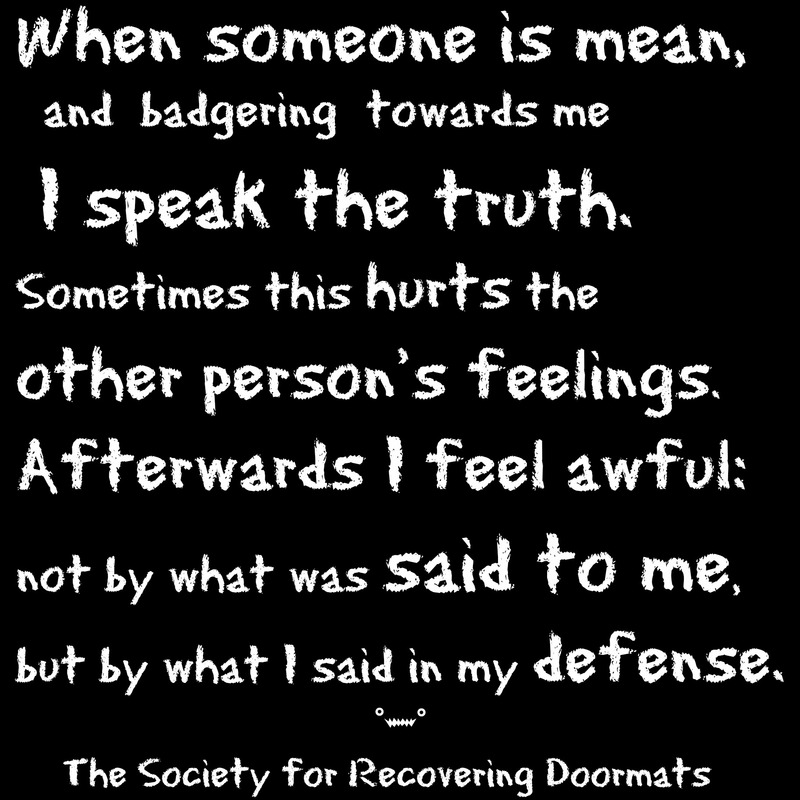 During recovery from doormatism, it’s hard to speak our truth. But we must learn how to despite possible residual negative feelings. The moment the words are spoken we may start traveling down the river of doubt. Then perhaps, turn in ourselves, beating our self up with false beliefs of unworthiness. And then our most self destructive behavior: forgetting WHY we spoke our truth in the first place. Forgetting we have the right to defend ourselves without guilt, shame or concern if we’ve upset our abuser is detrimental. The good news is: our level of uncomfortableness fades the more we practice self care. Stand up, speak out without guilt or shame. And so often, whether it be true, or manipulation when I stand up for myself and demand to be treated differently, or have someone explain to me WHY some really awful will have happened in their life. And then I feel like a REAL creep! Just an example, one time I was waiting for a response from someone who had really said some mean and nasty things and when I finally lost my temper and stood up for myself, they had had a death in their family and their silence didn’t have a thing to do with me. After a few times of THAT happening….I have a tendency to step back again. I used to be such a doormat to pretty much anyone and everyone. This started changing when I became pregnant and even more after my daughter was born. Now, when someone is being disrespectful, I physically feel ill and can’t hold it in any longer. The more I stand up for myself and truth, in general, the less I feel guilty. I never want my daughter to let herself be mistreated or abused, or for her to treat others in this way. I realized that if I continued to allow other people to treat me in those ways, I was setting her up for the cycle of doormatism to continue. What started long before I was born, is being stopped with my precious child.